Easy Italian chopped salad; add some crusty bread and you are good to go. About a year ago we had stopped at Subway to pick up some sandwiches. There were a few people ahead of us in line. One of the people in line ordered a chopped salad. I remember watching the person behind the counter making the salad and was amazed. It was my first time seeing one made. I made a mental note about making one of these salads for my blog. Well, here it is a year or so later and I finally made my first chopped salad. I wish it would not have taken me so long. 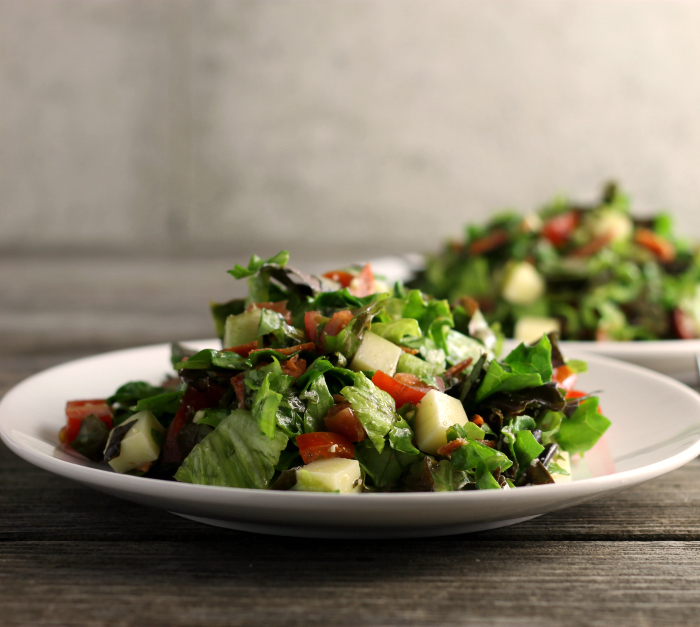 This easy Italian chopped salad is great for a lighter meal. I made this for our Sunday dinner. We had been at our church festival and eaten a larger lunch, so Mike and I were not in the mood for another large meal. 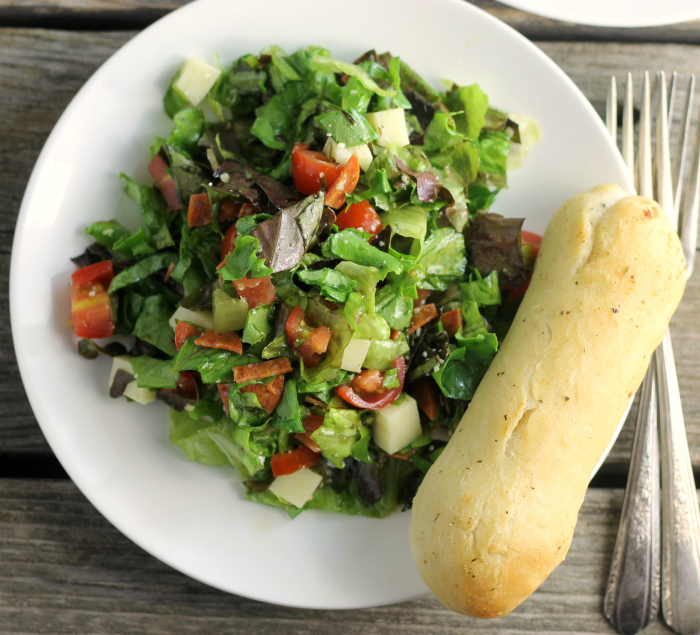 When we got home from the festival I made a batch of bread sticks to go along with this easy Italian chopped salad. (I will be sharing them on my next post). The crusty bread sticks were the perfect thing to go with the salad. If you have ever watched someone in a restaurant making a chopped salad you will see them using their fancy knives for making these salads. Don’t worry if you don’t have one. My kitchen is not equipped with one either. I diced and chopped with one of my kitchen knives and it worked fine. What I really liked about the chopped salad and found somewhat amazing was how the dressing coated the lettuce so perfectly. Every bite of the salad was nicely coated with dressing, so full of flavor. Have you ever eaten a chopped salad? 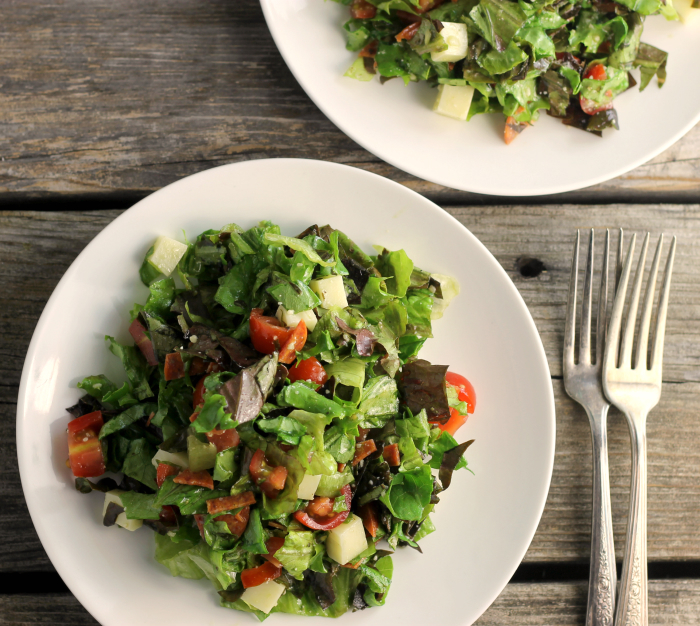 If not you need to try this easy Italian chopped salad. Take the red and green leaf lettuce and with a sharp knife cut/chop into small pieces. Add the lettuce to a large bowl. Slice the pepperoni into thin slices. Toss in the bowl with the lettuce. Cut the cherry tomatoes into quarters or smaller. Toss in the bowl with the lettuce and pepperoni. Cut the mozzarella into small cubes. Toss into the bowl with the rest of the ingredients. In a mini food processor add the garlic and process. Add the red wine vinegar and olive oil and process. Add the Parmesan and Italian seasoning. Toss the lettuce, pepperoni, tomatoes, and mozzarella cheese. Pour the dressing over the salad. 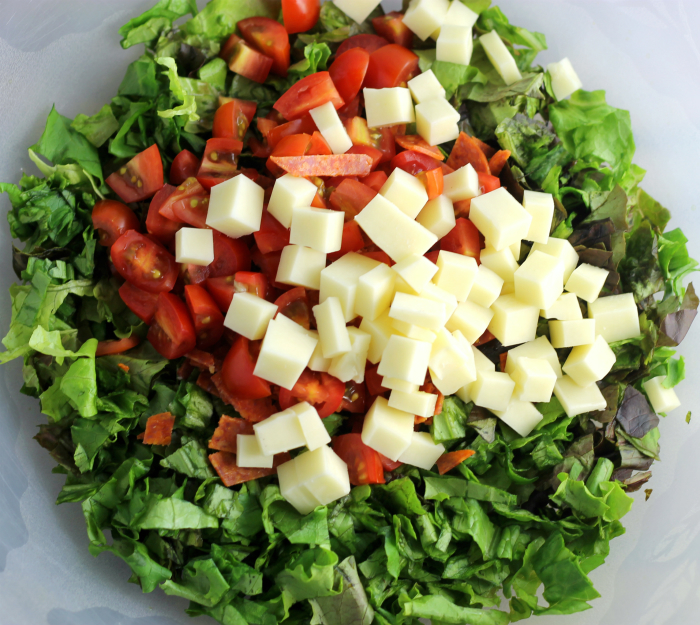 Toss the salad until the dressing coats the ingredients evenly. Who doesn’t like chopped salad? Such good stuff. And yours looks wonderful! Really good job with this — thanks. I love chopped salads. This makes a light and delicious dinner. I love a simple chopped salad and this one looks like it would be perfect with nearly every meal!!! A delicious classic! Awww! This makes me sad! I just got back from Italy last night…. Gotta make this salad to remind myself of how tasty it was over there! Italian chopped salad is one of my husband favorite salad…he always order when he sees on the menu…thanks for the recipe Dawn…looks delicious! I don’t eat much salad (most of my meals are plant-based), but when I do eat chopped salad, I like how it all comes together in each bite.